The Pastures for Upland Birds Program (PUB) provides cost-share incentives and technical guidance to private landowners to restore native grass and forb vegetation on pastures and hayfields dominated by exotic grasses such as Bermudagrass, bahiagrass, and Old World bluestems. Funding for this TPWD Program is made possible, in part through a cooperative agreement with the USFWS Partners for Fish and Wildlife Program. All projects approved for funding are thereby subject to the terms and conditions of that Agreement. Historically, native tallgrass prairies and prairie-oak savannahs dominated over 24 million acres in east-central Texas. These ecosystems provided essential habitats for many forms of wildlife, including for grassland birds. 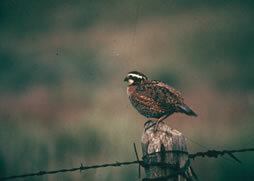 Grassland birds that were part of the native prairie ecosystem included: Eastern Meadowlark, Northern Harrier, Le Conte's Sparrow, Short-eared Owl, Dickcissel, Scissor-tailed Flycatcher, Mourning Dove, Northern Bobwhite, Eastern Wild Turkey, and others. Over the last century and a half, the region's native prairies and savannah grasslands were converted to agricultural land uses and have virtually disappeared. One of the obvious consequences of this massive prairie conversion was the loss of millions of acres of natural biological diversity and wildlife habitat. Breeding Bird Surveys show that most grassland bird species have continued to experience long-term population declines. The widespread and persistent nature of these population declines has made grassland bird conservation a national priority. PUB promotes grassland bird conservation on private lands by restoring native prairie vegetation on exotic grass pastures and hayfields. Native prairie vegetation established through PUB will increase biological diversity and provide habitat for resident, breeding, migrating, and wintering bird populations. Under proper management, native grass-forb pastures and hayfields can also provide nutritious livestock forage. PUB will service a focal area in east-central Texas coinciding with portions of Blackland Prairie and Post Oak Savannah focus area map. Texas Parks and Wildlife Department will provide herbicides, native grass and forb seed mixtures, technical guidance, and a no-till seeder (as available). 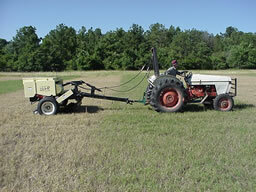 The participating landowner will provide labor associated with any pretreatments (grazing, prescribed burning, etc. 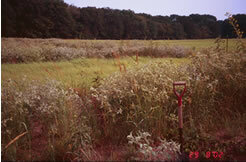 ), herbiciding, native plant seeding, or any supplemental treatments identified by the project plan. TPWD field biologists with extensive experience in native prairie restoration have identified over 40 native species of plants for seeding in PUB projects. Some representative species include: little bluestem, big bluestem, indiangrass, sideoats grama, switchgrass, Engelmann daisy, Illinois bundelflower, purple coneflower, partridge pea, and butterfly milkweed. Contact your local TPWD biologist to set up a site evaluation (Use the map at bottom of left-hand menu on this page or find your local TPWD biologist or USFWS biologist to assist you with applying for funding). Schedule and conduct a site visit of your property with the local TPWD biologist. Work with the biologist to prepare a project proposal. Submit the plan to TPWD for approval. Monitor progress of prairie vegetation restoration.